Our “gogga” of the month for September will usually manifest with the appearance of colonies of aphids on young plant stems, leaves and buds, as well as honeydew on leaves and fruit, with black sooty mould, or yellowing leaves. 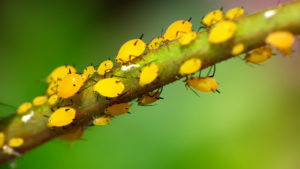 Eradicate biting and sucking insects like aphids, by spraying with a contact insecticide every two weeks or by a seasonal soil drench with a systemic insecticide. Visit your local GCA garden centre for advice on the best insecticide.